Looking back over many years, I can honestly say that much of my life has been a preparation period for painting this particular series. Most artists speak of preparation in terms of what they have learned that demonstrates good craftsmanship in their work. They talk about developing drawing skills, applying the rules of composition, studying color and perspective, etc. However, to the Christian artist who desires to create works that communicate spiritual truths, this spiritual preparation is of utmost importance, though he must not neglect the study of fundamental skills. The Christian artist should paint images that are birthed in his heart by the Holy Spirit through meditation on the written word of God. He must grow in the knowledge of what God is really like, because his paintings will reflect what he is learning and the kind of relationship he has with Him. He cannot testify beyond his own experience in God, and growing in that experience takes time. So it is understandable that much of my life has been a preparation period for painting "The Bride of Christ." And there is still so much more to learn! In contemplating this series I asked myself the question: "How can the believer exchange a lukewarm heart for a heart filled with passion for God"? The answer implicated in God's Word is, "We love Him because He first loved us." (John 4:19) So in order to ignite our hearts in whole-hearted devotion to Him we must somehow catch a glimpse of God's ravished heart for us. 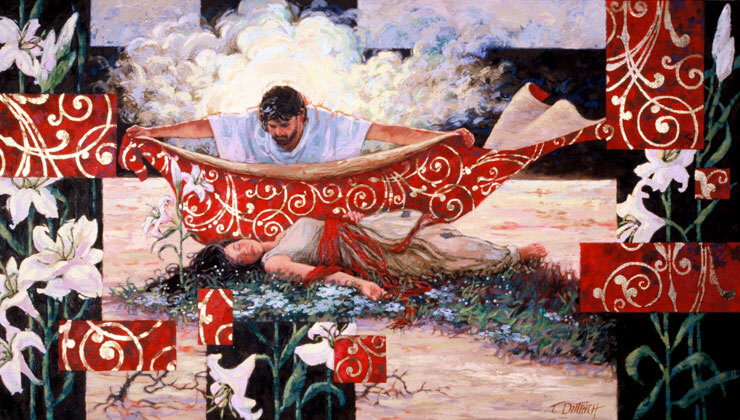 This glimpse - the visual perspective of Christ's love - is what I have attempted to describe in paint. It is my hope that as you view the paintings you will find yourself identifying with the Bride and wooed into a closer relationship with Jesus Christ, the Bridegroom God. I pray that you will be drawn into making the same confident declaration as the Shulamite as she proclaims, "I am my Beloved's, and His desire is toward me." (Song 7:10) Understanding this perspective will change your life as it has changed mine! For additional resources and information regarding the Bride of Christ, visit ihop.org.